LOOKING FOR QUICK SALE- A turn-key business in a highly desirable location in a busy area that requires no prior experience. Flexible management structure allows owner-operator or semi-absentee owner, keeping the security of full-time job. With a gross revenue of $220,000 this is this is an Ideal opportunity for a highly motivated entrepreneur. In addition GROSS SALES can be increased by offering smoothies, catering and delivery service. THIS IS GREAT OPPORTUNITY FOR SAVVY buyer. Confidentiality is important. Must show proof of funds and be able to close fast. Kahala Brands, the franchisor of Blimpie, is one of the fastest growing food franchise companies in the world with over 2500 restaurants around the globe. With a large selection of high-quality, quick-service restaurant brands, Kahala is dedicated to developing tested business models while providing its Franchisees with tools and support. Kahala is structured to support its franchisee’s business by achieving synergies and costs-savings for the franchise community by bundling “back of the house” functions, where the entire franchise community benefits from shared teams in purchasing, finance, real estate, business training and IT to capitalize on economies of scale. 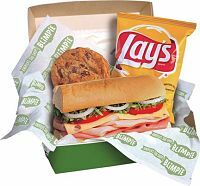 A brand president is at the heart of the business and is equipped with a team of passionate sales, marketing and operations talent to support Blimpie sub sandwich franchises and its franchisees. This type of support is unique in the food franchise industry and sets Kahala apart from its competitors. "I LOVE OWNING MY BLIMPIE RESTAURANT. BOTH MY SONS ARE INVOLVED IN THE BUSINESS AND IT GIVES ME GREAT PRIDE THAT I CAN PROVIDE FOR THEIR FUTURE AS WELL AS MINE." – MILLIE V., BLIMPIE FRANCHISEE, NEW JERSEY. Blimpie offers our Franchisees a simple business model, steadfast support and highly competitive franchise fees. 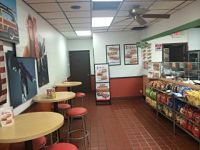 Blimpie wants its franchisees to be successful and take pride in their business. Owning a Blimpie can give you the opportunity for you to reach your lifestyle and financial goals. To find our more about this Blimpie location, Please fill out the form below and submit.